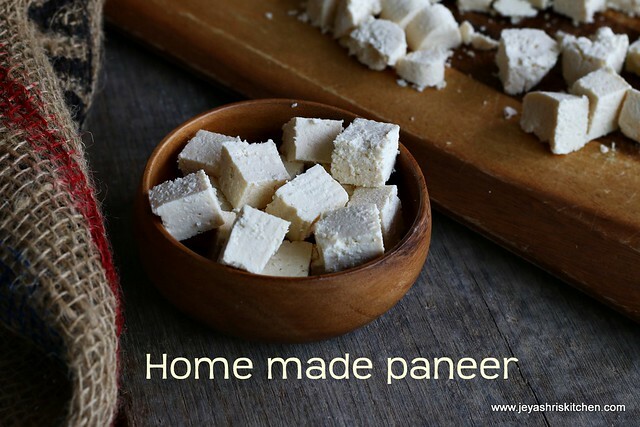 Paneer | Indian cottage Cheese, i generally buy from the Indian shop. 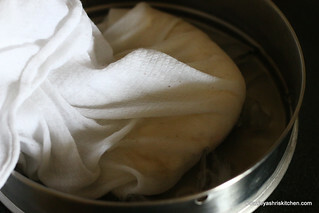 This is the first time i making paneer at home. 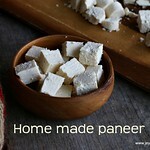 I was thinking for a while to make paneer at home but some how it has been getting post poned. The reason may be i get good paneer here. Last week when i went to the Indian shop the usual paneer brand which i buy, the Kohinoor, was not available. 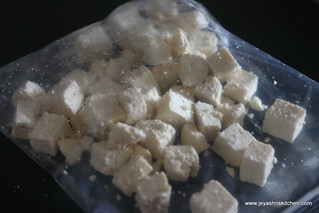 I picked up Vadilal, luckily i bought a small packet. It was very hard and rubbery. So immediately the next day i tried paneer at home, it came out pretty well for the first time. I learnt few things in this process which i should follow the next time. Do not forget to read the "Notes" section below. 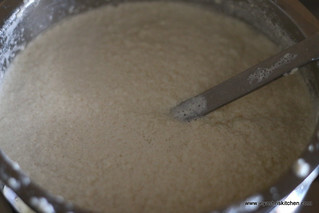 Preparation Time : 5mins + 3 hrs(resting time) | Cooking Time :15 mins | Yields : 200 gms approx. 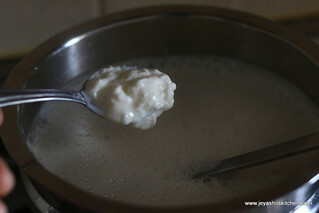 When the milk is boiling lower the flame and add the yogurt to this. 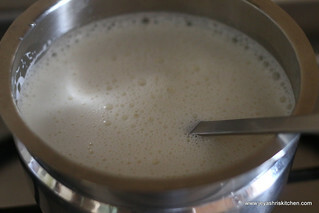 The milk will start curdling by this time. When the milk solids floats on the top and the whey separates switch off the flame . Place the ice cubes in a wide bowl. 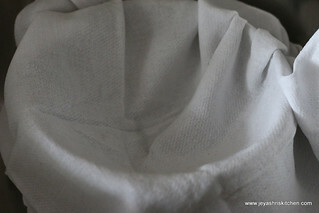 Immediately drain the whey and transfer the milk solids settled on the cloth in the bowl of ice cubes. Let this cool in for few minutes. 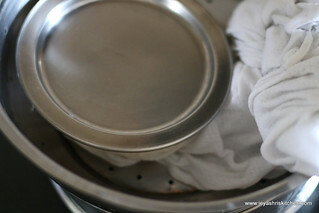 Squeeze out the extra water and keep the cheese with the towel in a strainer and place a flat plate on it. The purpose of keeping flat plate is to get the proper shape. 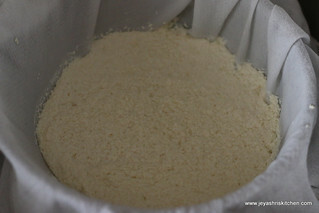 At this stage, if you are adding all purpose flour, you can add. This acts as a binding agent. 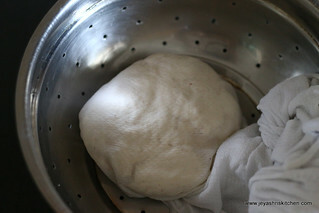 Even if you want smooth texture of paneer you can knead this nicely and then put in the cloth and place the over it. Keep a heavy thing on this one. I used my mortar . You can keep a iron dosa tawa too.Let this sit undisturbed for 3 hours. Paneer will be done . You can either store it as a block. You can cut this and store in a zip lock cover in the freezer. You can store this in freezer for 1 week to 10 days. Never cook the milk once it is curdled. 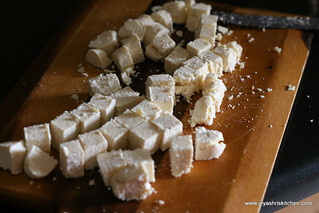 This will make the paneer hard and rubbery. 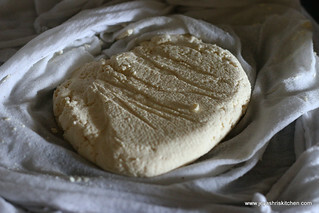 To get smooth texture of the paneer knead this before placing heavy weight on it. Do not directly keep the weight on the paneer. 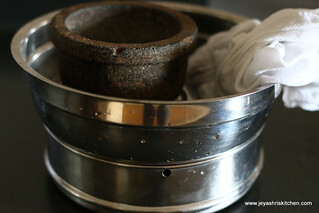 Sometimes the black iron tawa or the mortar's black things will go into the paneer. Always keep a plate and place it over that. Thanks for the recipe.Will try and tell u soon. Thaks jeya.. Is there any use of the 'whey' ? 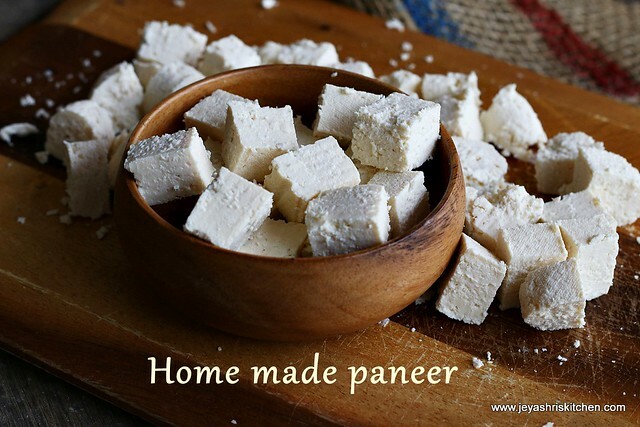 Just prefect they are, homemade paneer is always the best. usually we add lemon juice right?/// will curd works out well?????? Yes curd will work out well too.